This pasta dish is well worth the extra effort. Any white fish will work and shrimp is also a great addition. I have added broccoli to add a little color to. Be sure to serve with garlic bread to mop up any extra sauce. 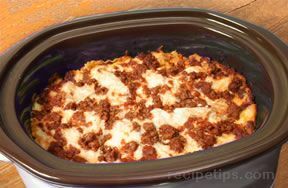 Cook the lasagna noodles in a large pot of boiling salted water until al dente; drain. In a large saute pan, saute onion in the butter for 5 minutes, until softened. In a medium bowl, combine the ricotta, cream cheese, basil, salt, pepper, egg, and sauteed onion. Set aside. In a lage bowl, combine the mushroom soup, milk and garlic. 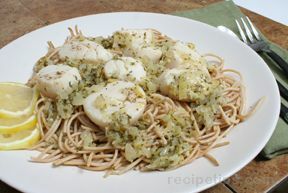 Stir in the white wine, bay scallops and fish fillets. Set aside. To assemble ingredients spread a thin layer of seafood sauce on the bottom of the prepared pan. Then top with 4 noodles. Next layer with half of the cheese mixture and 4 noodles again. Layer half of the seafood mixture and top with 4 noodles. Repeat. Place mozzarella cheese and Parmesan on the top. Cover with aluminum foil. Bake for 45 minutes. Remove foil and bake 10-15 minutes more, until cheese has browned.